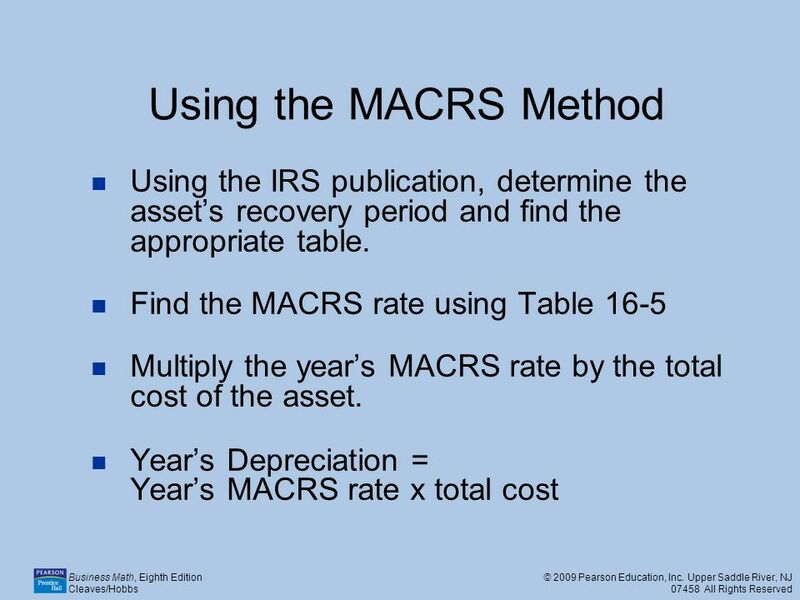 Business Math, Eighth Edition Cleaves/Hobbs © 2009 Pearson Education, Inc. Upper Saddle River, NJ 07458 All Rights Reserved 16.1 Depreciation Methods. 3 Business Math, Eighth Edition Cleaves/Hobbs © 2009 Pearson Education, Inc. Upper Saddle River, NJ 07458 All Rights Reserved Key Terms Assets: properties owned by the business, including anything of monetary value and anything that can be exchanged for cash or other property. 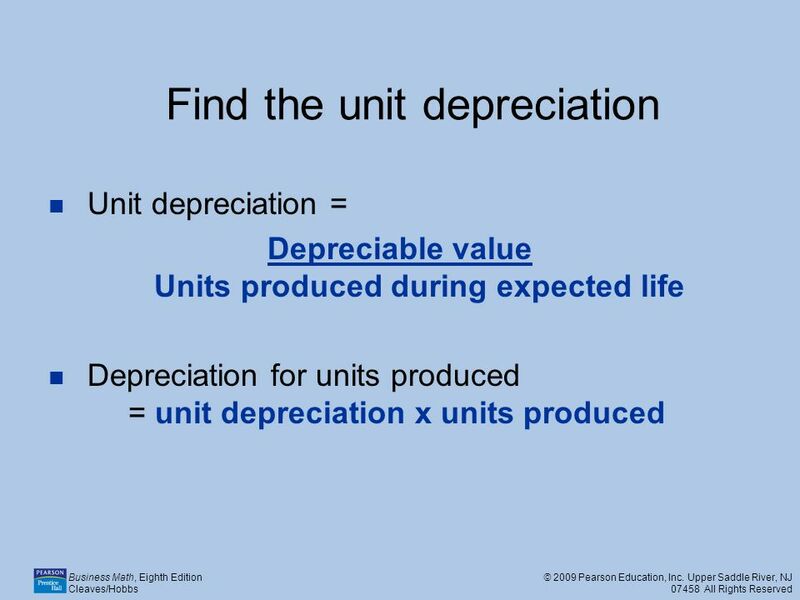 Estimated life or useful life: the number of years an asset is expected to be useable. 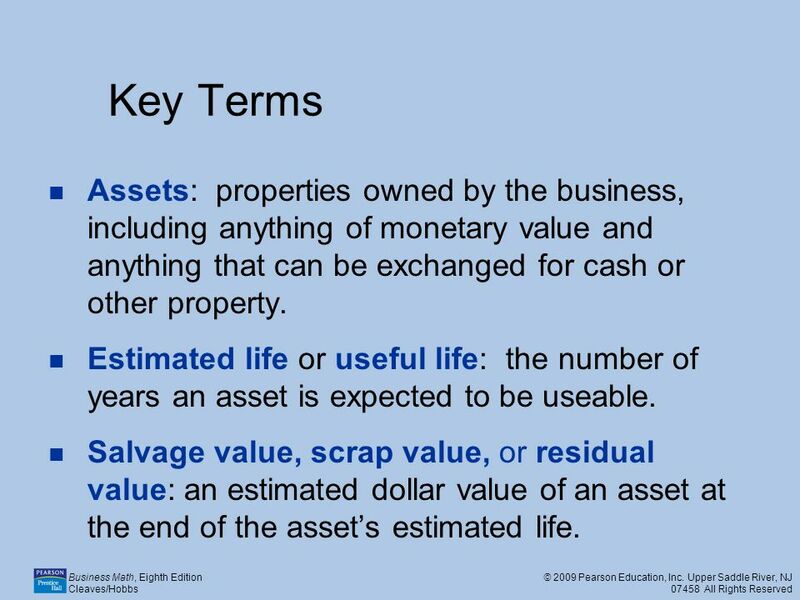 Salvage value, scrap value, or residual value: an estimated dollar value of an asset at the end of the asset’s estimated life. 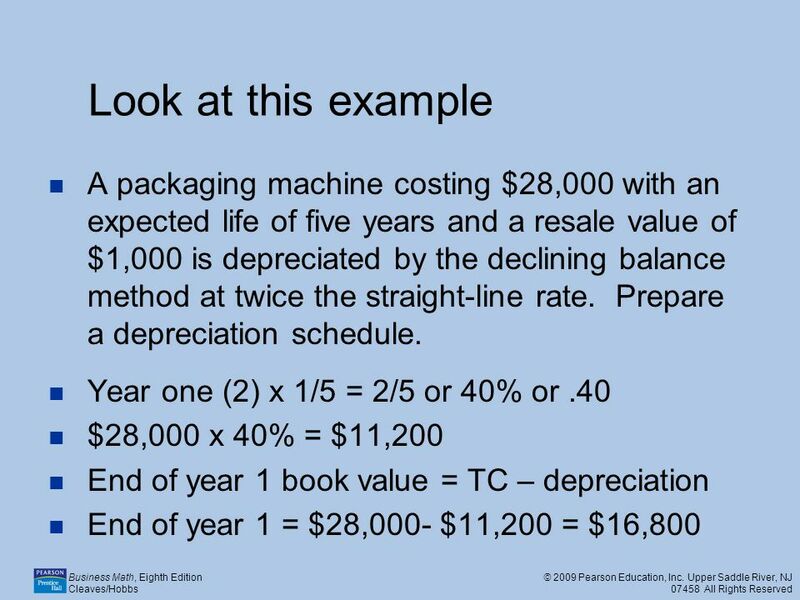 12 Business Math, Eighth Edition Cleaves/Hobbs © 2009 Pearson Education, Inc. Upper Saddle River, NJ 07458 All Rights Reserved Find the depreciation Unit depreciation = depreciable value ÷ units produced during expected life Unit production = $27,000/ 50,000,000 Unit depreciation = $0.00054 Depreciation for 2,125,000 labels = $0.00054 x 2,125,000 = $1,147.50 The depreciation for that number of labels is $1,147.50. 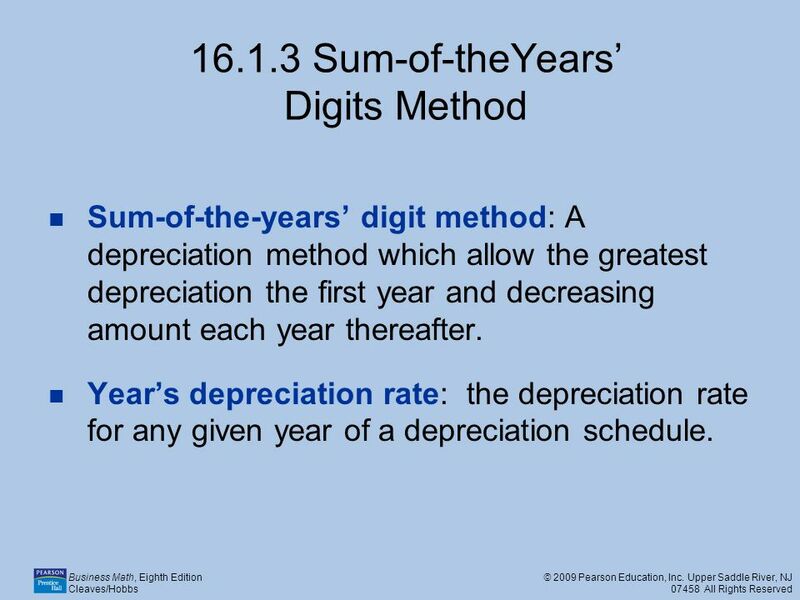 14 Business Math, Eighth Edition Cleaves/Hobbs © 2009 Pearson Education, Inc. Upper Saddle River, NJ 07458 All Rights Reserved 16.1.3 Sum-of-theYears’ Digits Method Sum-of-the-years’ digit method: A depreciation method which allow the greatest depreciation the first year and decreasing amount each year thereafter. 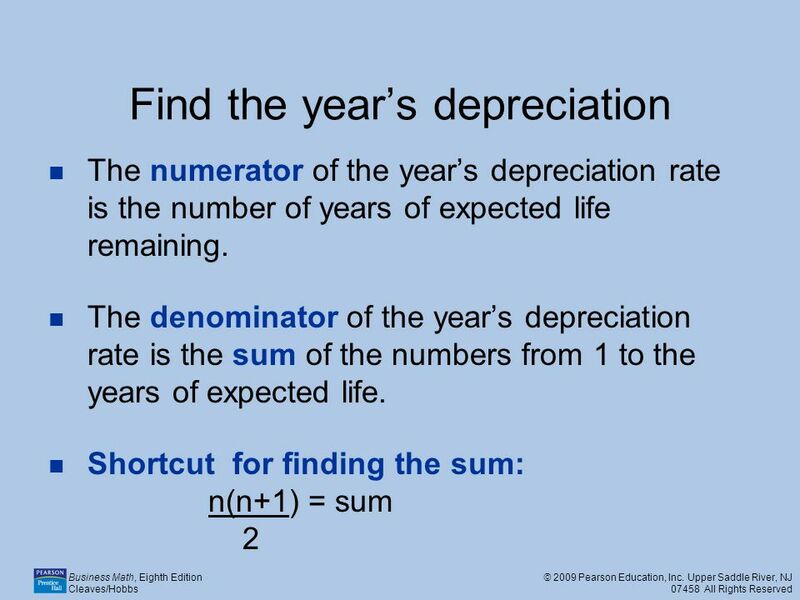 Year’s depreciation rate: the depreciation rate for any given year of a depreciation schedule. 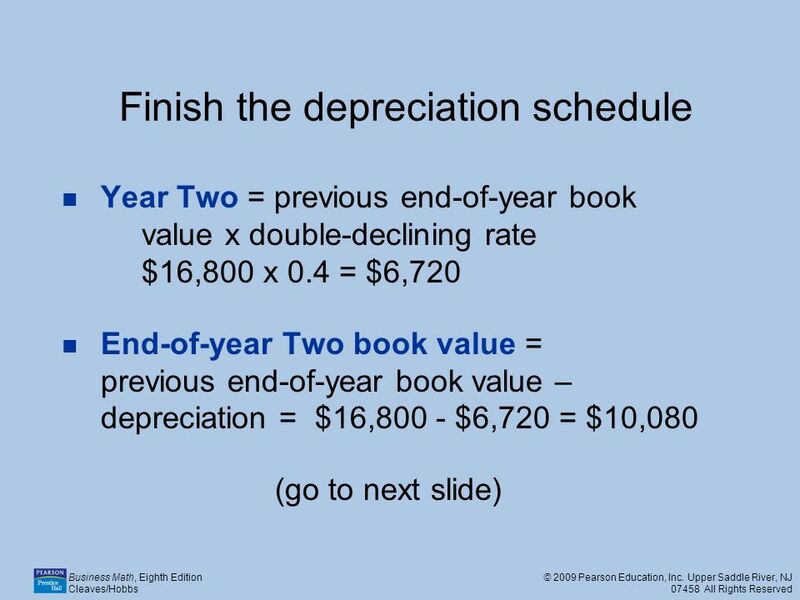 17 Business Math, Eighth Edition Cleaves/Hobbs © 2009 Pearson Education, Inc. Upper Saddle River, NJ 07458 All Rights Reserved Depreciation schedule Year 1 = $27,000 x 5/15 = $9,000 End of year book value = $28,000-$9,000=$19,000 Year 2 = $27,000 x 4/15 = $7,200 End of year book value = TC – accumulated depreciation = $11,800 Now, calculate the depreciation and book value for Years 3, 4, 5. 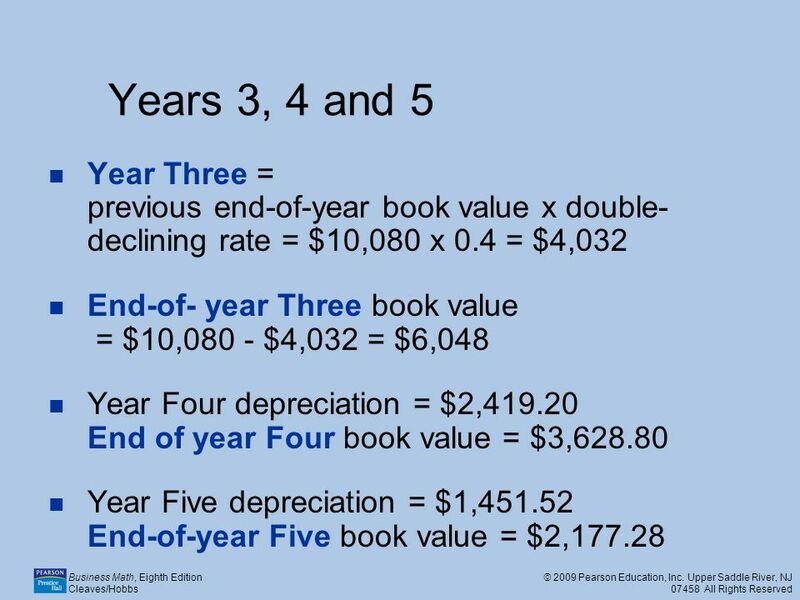 Y 3 $5,400 and end-of year book value is $6,400. Y 4 $3,600 and end-of year book value is $2,800. Y 5 $1,800 and end-of year book value is $1,000. 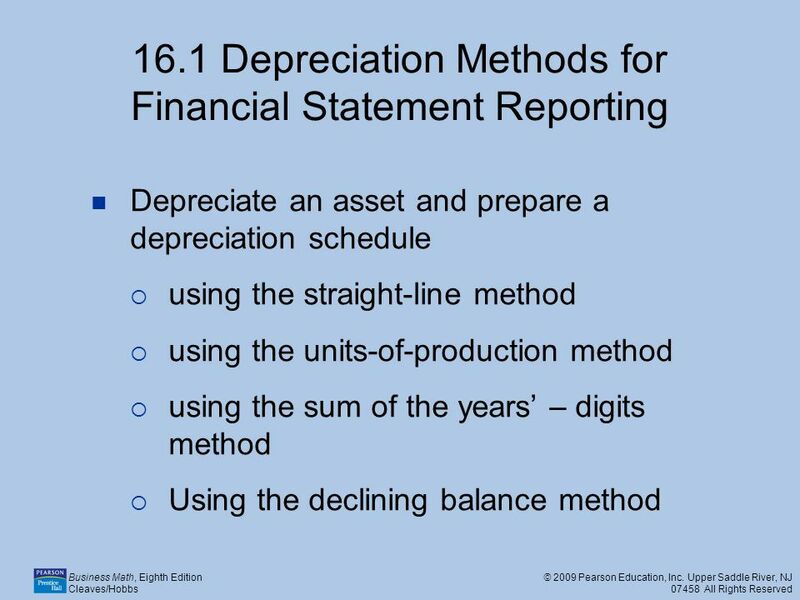 18 Business Math, Eighth Edition Cleaves/Hobbs © 2009 Pearson Education, Inc. Upper Saddle River, NJ 07458 All Rights Reserved 16.1.4 Declining Balance Method of Depreciation A depreciation method that provides for large depreciation in the early years of the life of an asset. 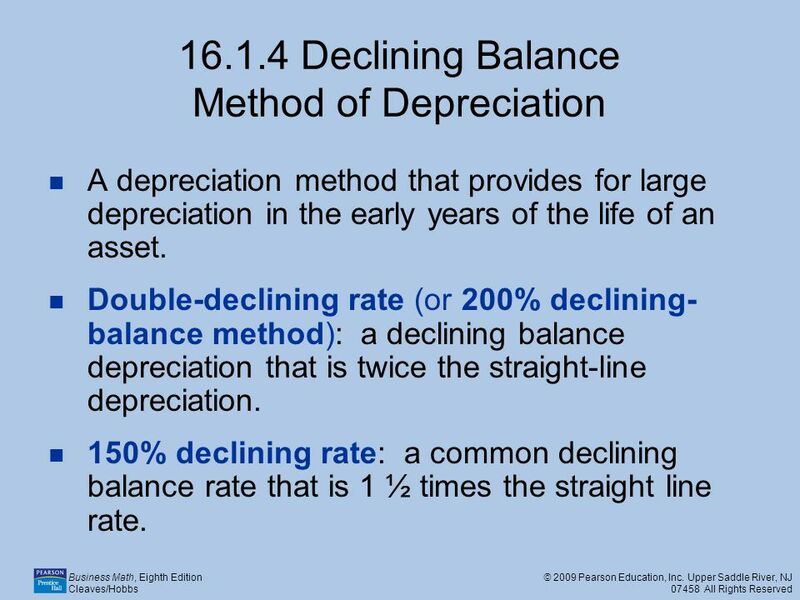 Double-declining rate (or 200% declining- balance method): a declining balance depreciation that is twice the straight-line depreciation. 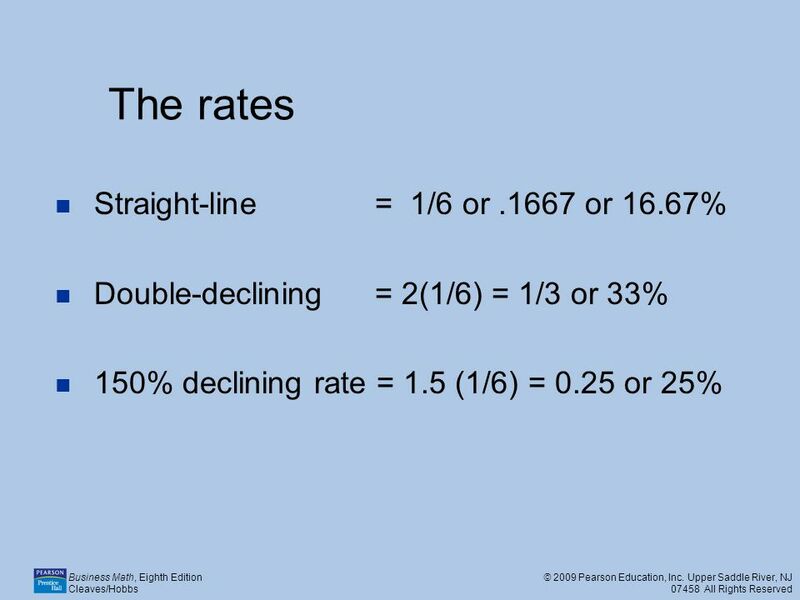 150% declining rate: a common declining balance rate that is 1 ½ times the straight line rate. 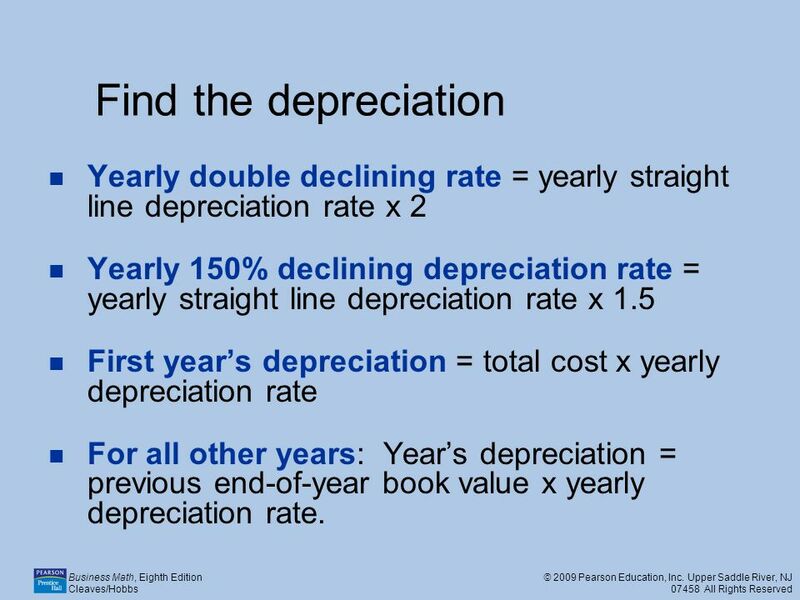 19 Business Math, Eighth Edition Cleaves/Hobbs © 2009 Pearson Education, Inc. Upper Saddle River, NJ 07458 All Rights Reserved Find the depreciation Yearly double declining rate = yearly straight line depreciation rate x 2 Yearly 150% declining depreciation rate = yearly straight line depreciation rate x 1.5 First year’s depreciation = total cost x yearly depreciation rate For all other years: Year’s depreciation = previous end-of-year book value x yearly depreciation rate. 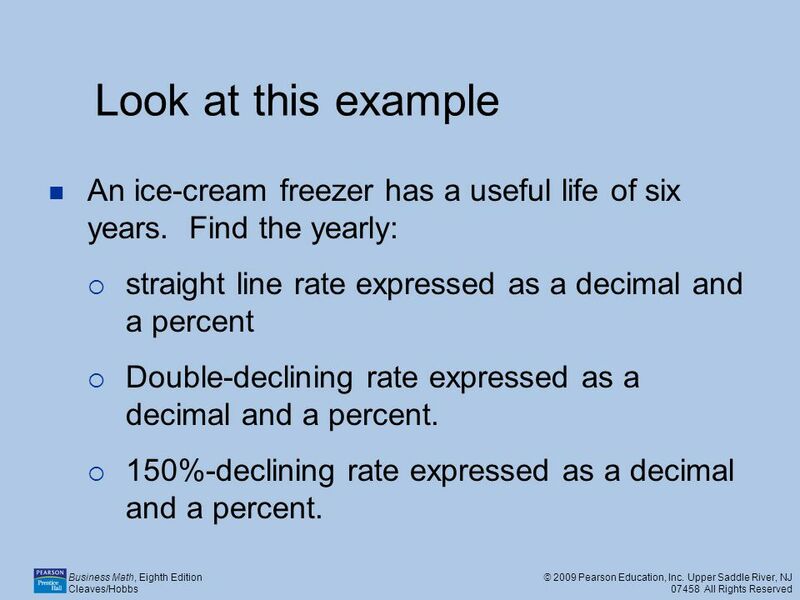 20 Business Math, Eighth Edition Cleaves/Hobbs © 2009 Pearson Education, Inc. Upper Saddle River, NJ 07458 All Rights Reserved Look at this example An ice-cream freezer has a useful life of six years. Find the yearly:  straight line rate expressed as a decimal and a percent  Double-declining rate expressed as a decimal and a percent.  150%-declining rate expressed as a decimal and a percent. 22 Business Math, Eighth Edition Cleaves/Hobbs © 2009 Pearson Education, Inc. Upper Saddle River, NJ 07458 All Rights Reserved Tip! 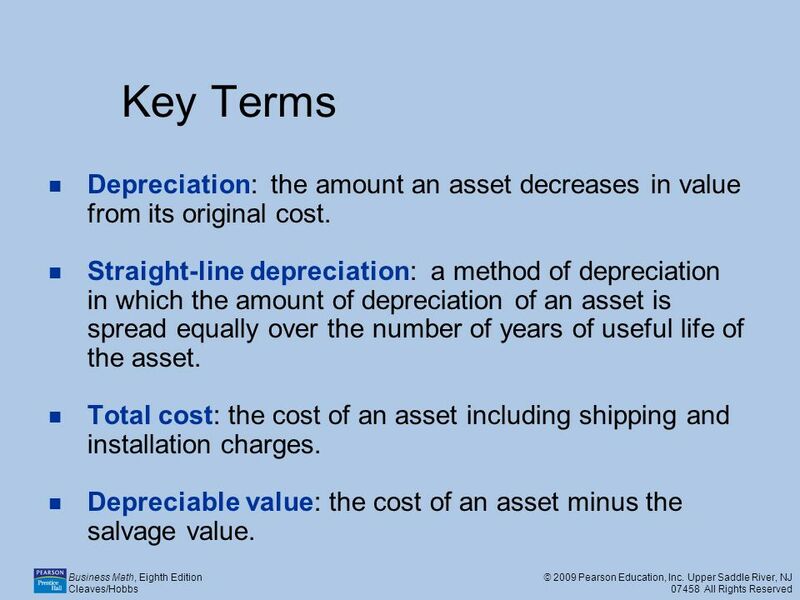 In declining-balance depreciation, the depreciation for the first year is based on the total cost of the asset. 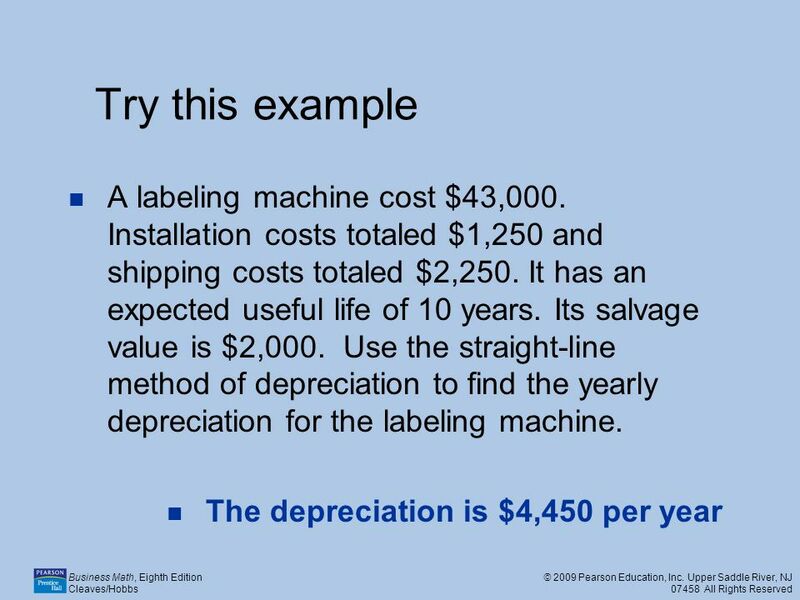 Do not subtract the salvage value from the total cost to find the depreciation in the first year. 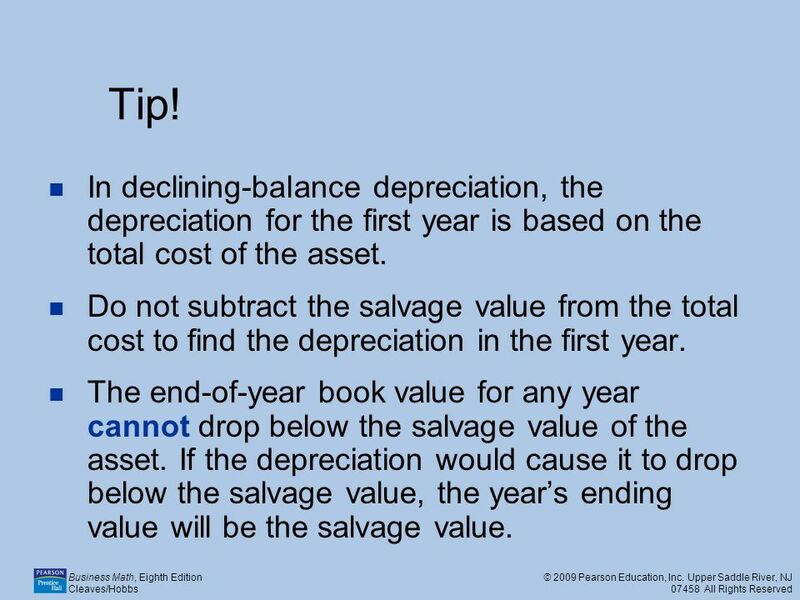 The end-of-year book value for any year cannot drop below the salvage value of the asset. 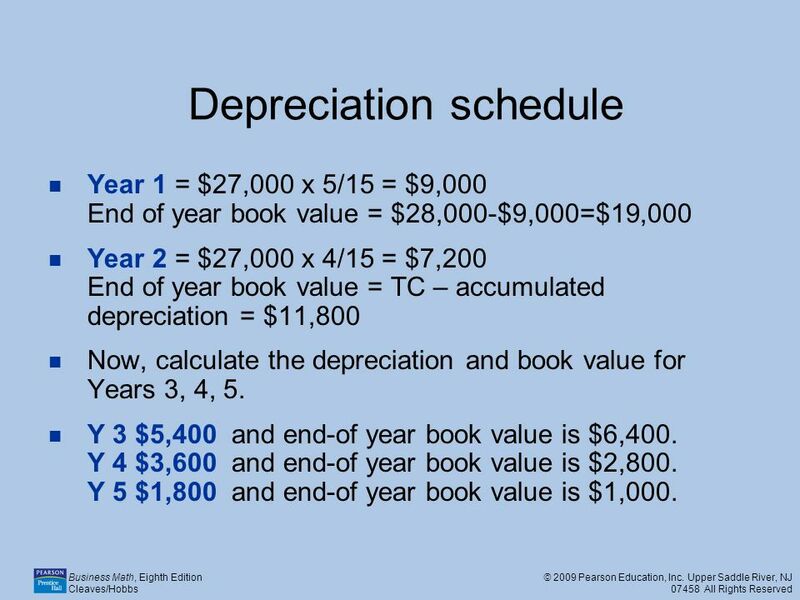 If the depreciation would cause it to drop below the salvage value, the year’s ending value will be the salvage value. 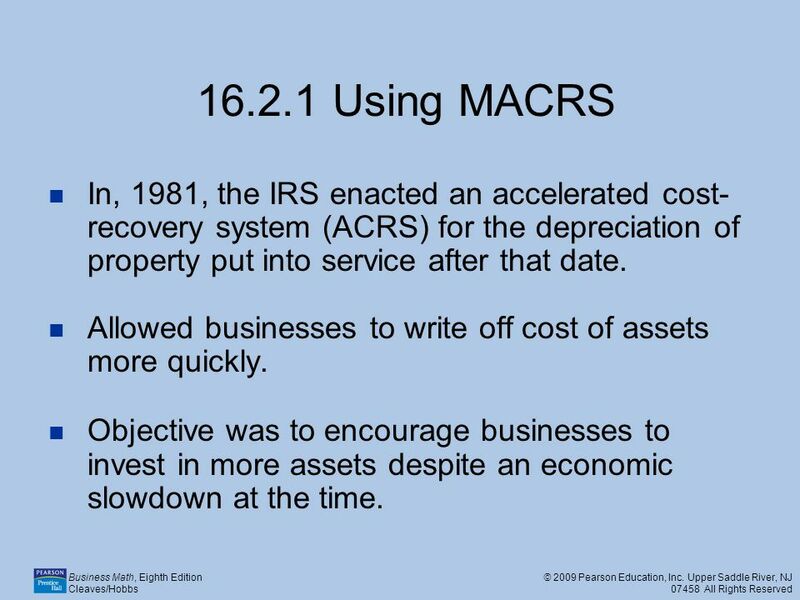 27 Business Math, Eighth Edition Cleaves/Hobbs © 2009 Pearson Education, Inc. Upper Saddle River, NJ 07458 All Rights Reserved 16.2.1 Using MACRS In, 1981, the IRS enacted an accelerated cost- recovery system (ACRS) for the depreciation of property put into service after that date. Allowed businesses to write off cost of assets more quickly. Objective was to encourage businesses to invest in more assets despite an economic slowdown at the time. 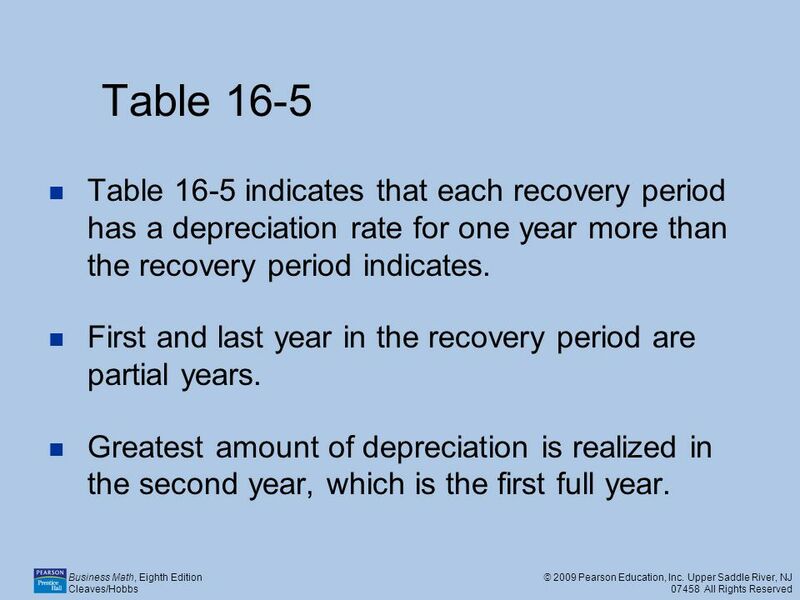 28 Business Math, Eighth Edition Cleaves/Hobbs © 2009 Pearson Education, Inc. Upper Saddle River, NJ 07458 All Rights Reserved Table 16-5 Table 16-5 indicates that each recovery period has a depreciation rate for one year more than the recovery period indicates. First and last year in the recovery period are partial years. 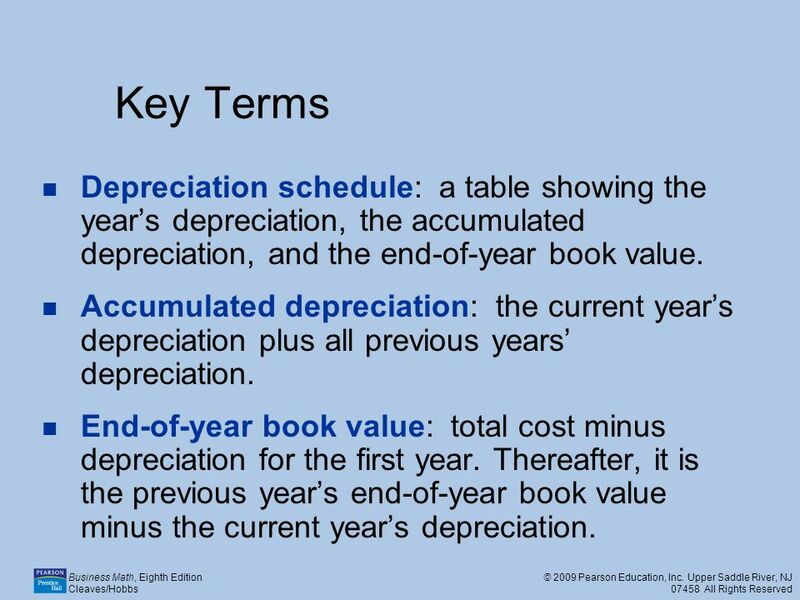 Greatest amount of depreciation is realized in the second year, which is the first full year. 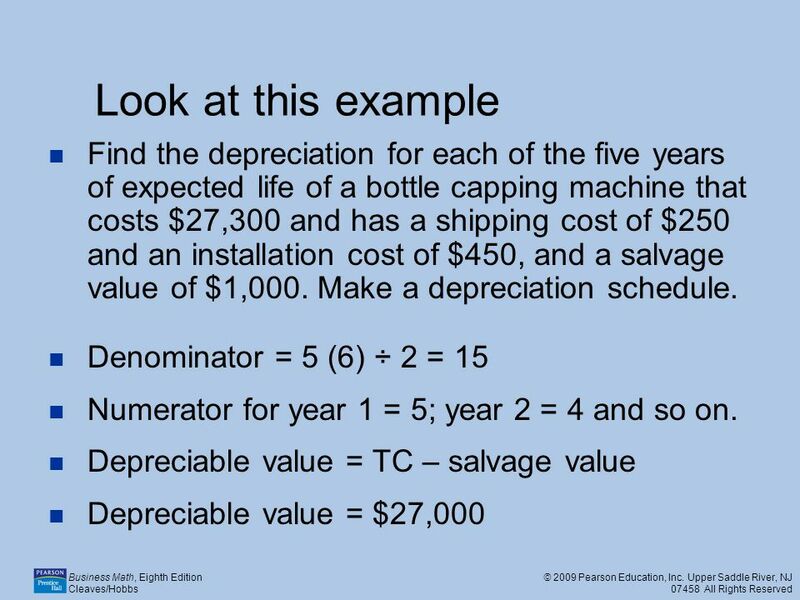 30 Business Math, Eighth Edition Cleaves/Hobbs © 2009 Pearson Education, Inc. Upper Saddle River, NJ 07458 All Rights Reserved Why is this easier than traditional depreciation methods? 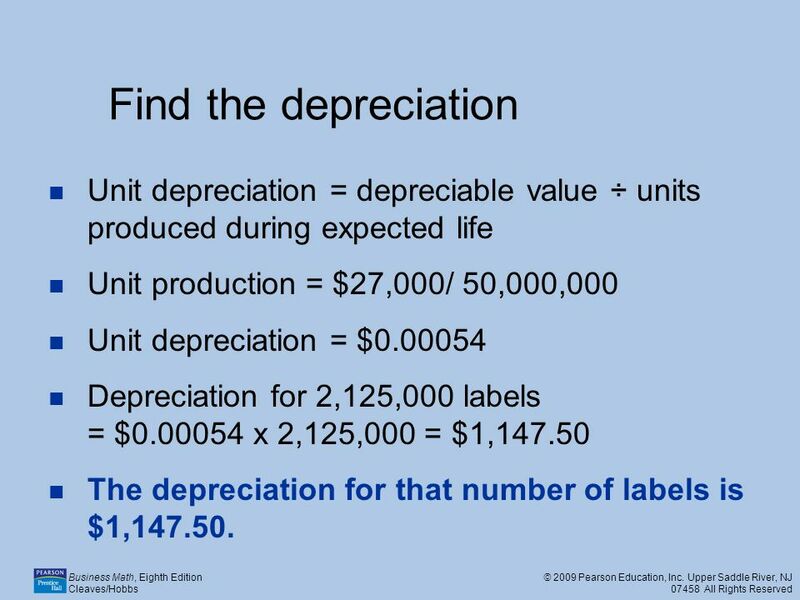 1.You do not have to find a depreciable value. 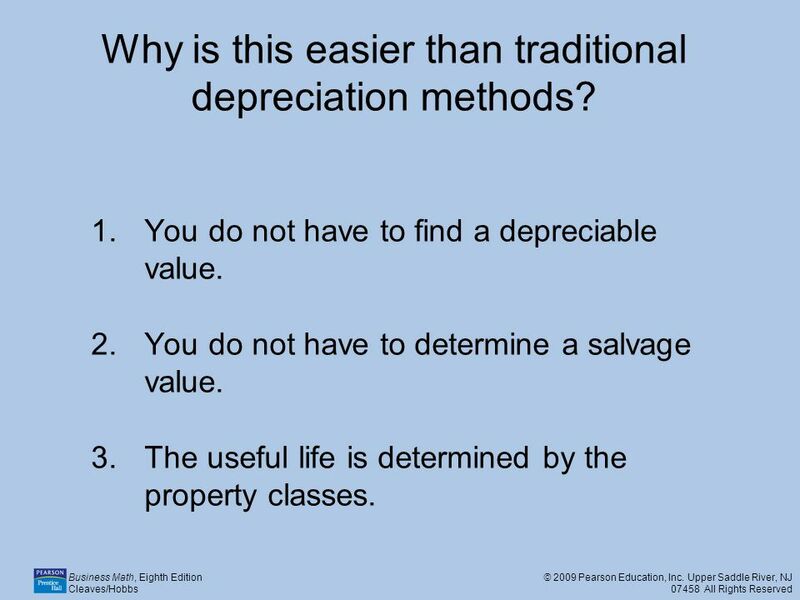 2.You do not have to determine a salvage value. 3.The useful life is determined by the property classes. 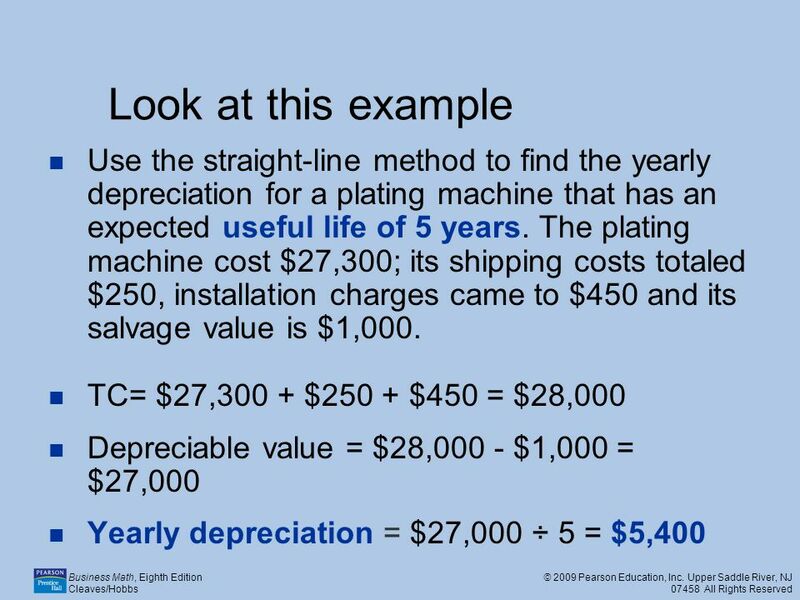 31 Business Math, Eighth Edition Cleaves/Hobbs © 2009 Pearson Education, Inc. Upper Saddle River, NJ 07458 All Rights Reserved Look at this example Find the depreciation for each year for a boiler that was purchased for $28,000 and placed in service at midyear under the MACRS method of depreciation as a five-year property. 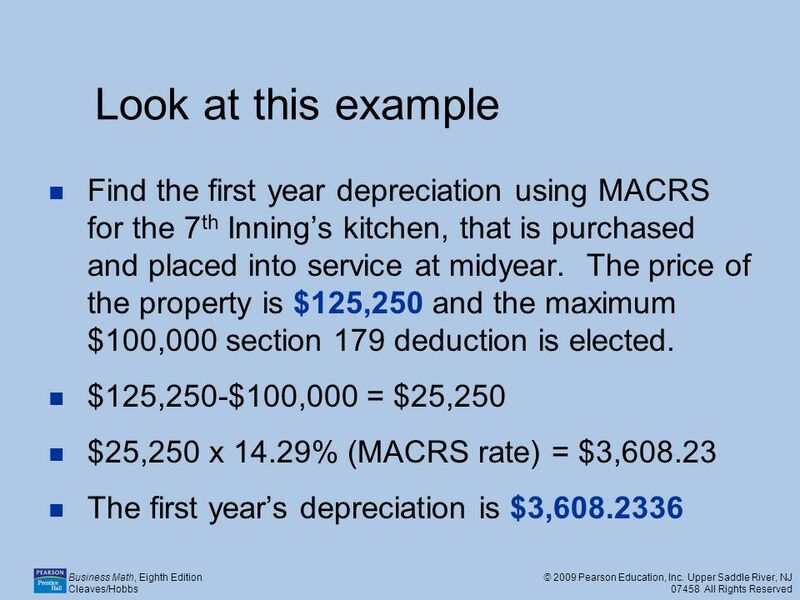 Year 1 depreciation = MACRS rate x Total Cost Year 1 depreciation = 20% x $28,000 Year 1 depreciation = $5,600 Do the subsequent years through Year 6. 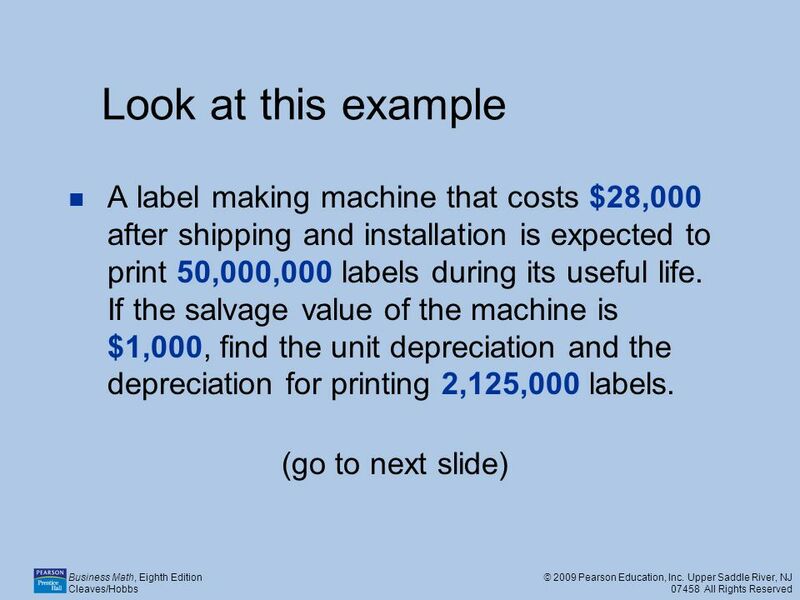 Check calculations on the following slide. 32 Business Math, Eighth Edition Cleaves/Hobbs © 2009 Pearson Education, Inc. Upper Saddle River, NJ 07458 All Rights Reserved Check your calculations. 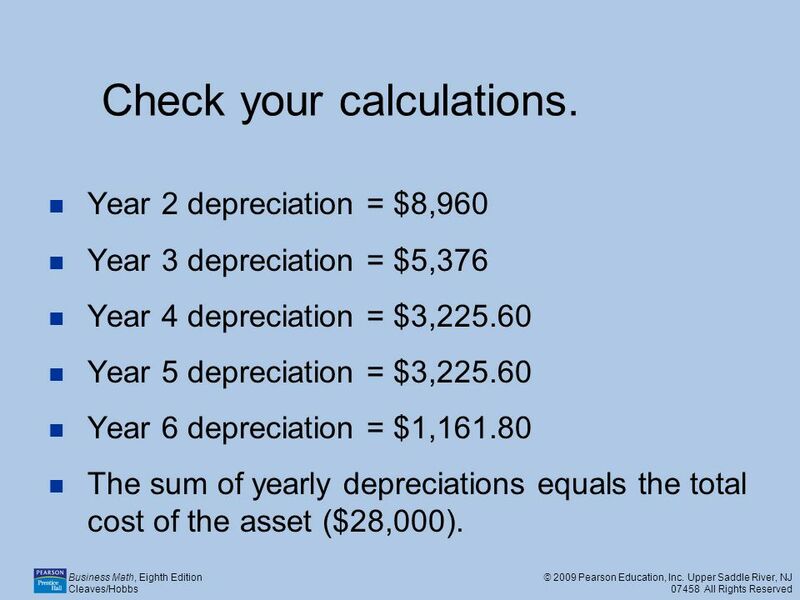 Year 2 depreciation = $8,960 Year 3 depreciation = $5,376 Year 4 depreciation = $3,225.60 Year 5 depreciation = $3,225.60 Year 6 depreciation = $1,161.80 The sum of yearly depreciations equals the total cost of the asset ($28,000). 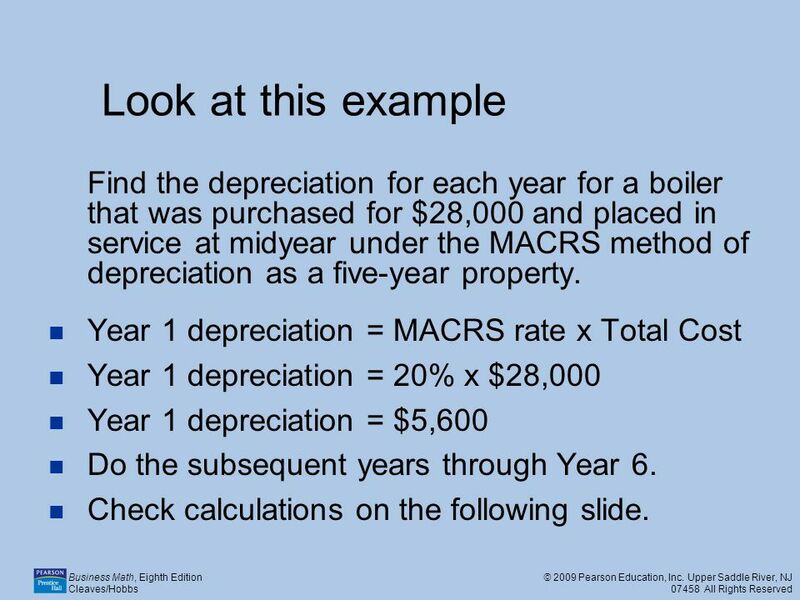 33 Business Math, Eighth Edition Cleaves/Hobbs © 2009 Pearson Education, Inc. Upper Saddle River, NJ 07458 All Rights Reserved 16.2.2 Depreciate an Asset After Taking a Section 179 Deduction For tax purposes, it can be treated as a one- time expense, rather than as a capital expenditure that is depreciated over several years. 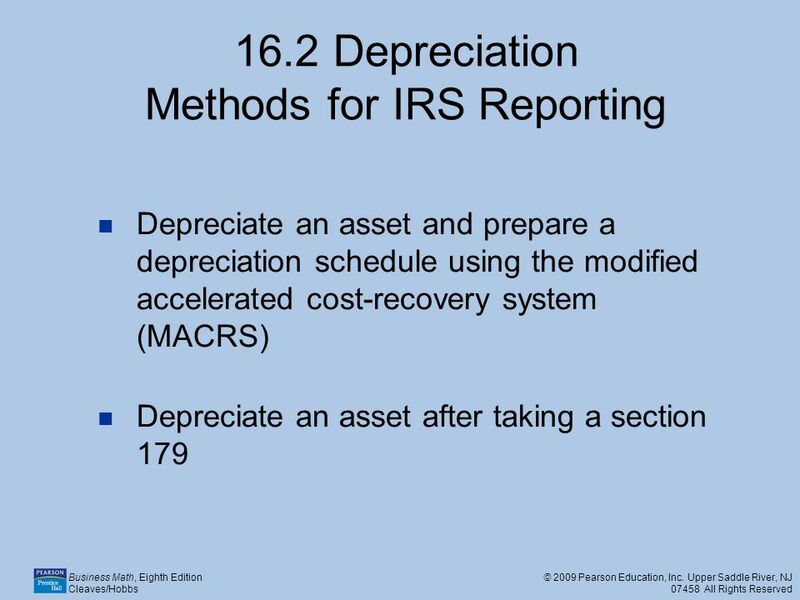 The amount that is claimed under Section 179 is subtracted from the original price of the property and the balance can be depreciated using any of the approved methods of depreciation. Eligible only in the first year that a qualifying property is purchased and placed into service. 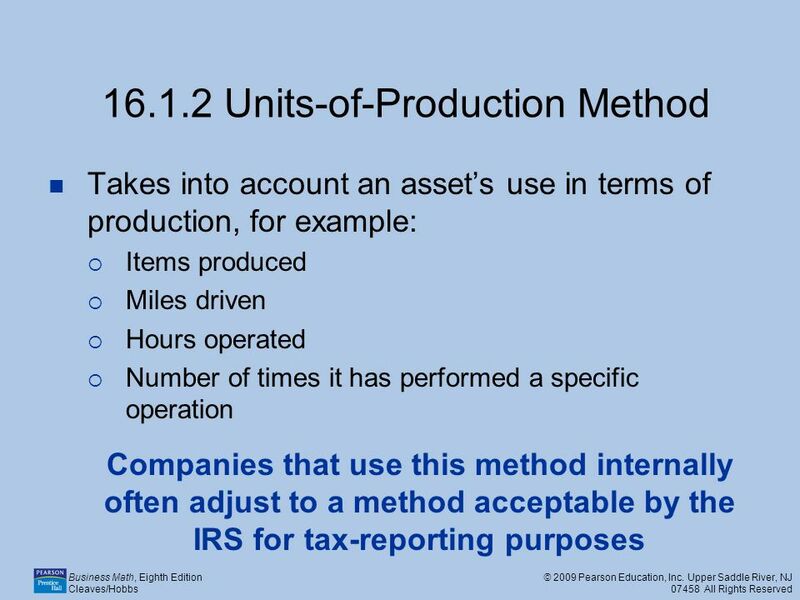 34 Business Math, Eighth Edition Cleaves/Hobbs © 2009 Pearson Education, Inc. Upper Saddle River, NJ 07458 All Rights Reserved Section 179 Deduction Property must be placed in service for business purposes only. A property put in service first for personal use and subsequently for business use would not be eligible. Eligible property, in general, is tangible, depreciable personal property that is used for the production of income. 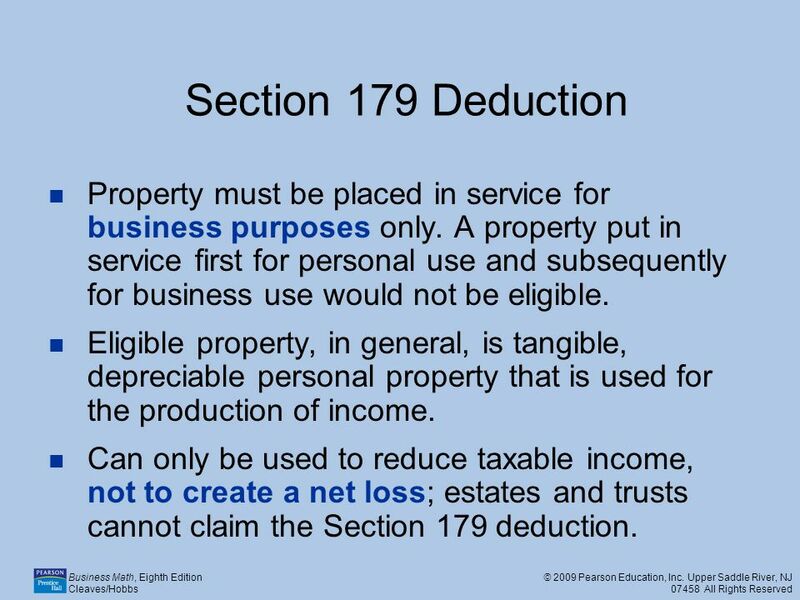 Can only be used to reduce taxable income, not to create a net loss; estates and trusts cannot claim the Section 179 deduction. 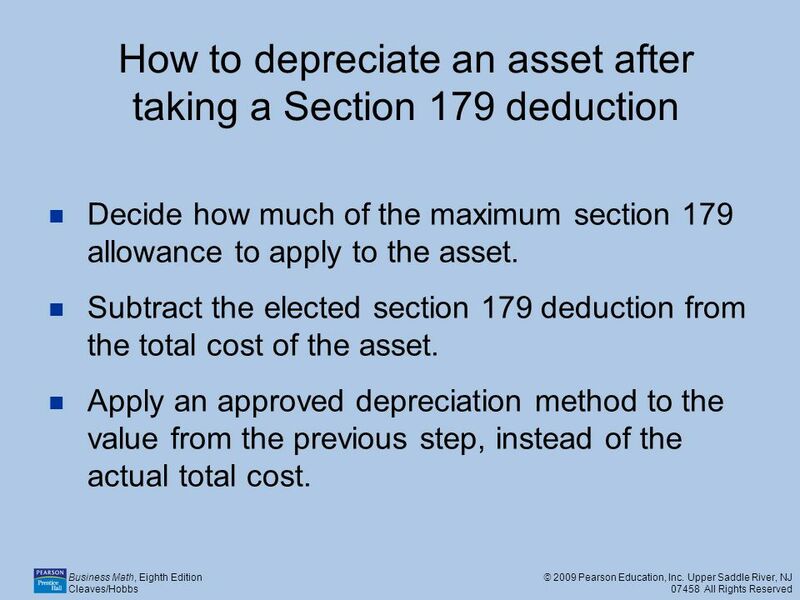 35 Business Math, Eighth Edition Cleaves/Hobbs © 2009 Pearson Education, Inc. Upper Saddle River, NJ 07458 All Rights Reserved How to depreciate an asset after taking a Section 179 deduction Decide how much of the maximum section 179 allowance to apply to the asset. 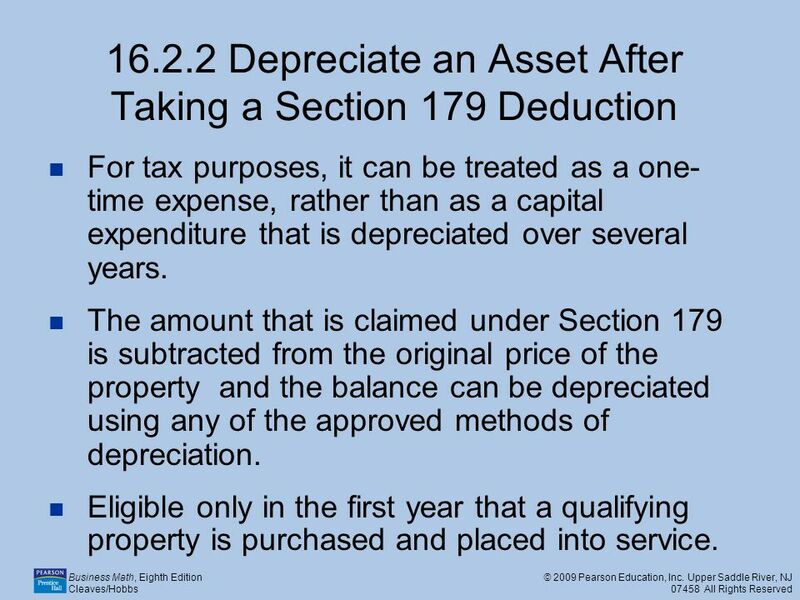 Subtract the elected section 179 deduction from the total cost of the asset. 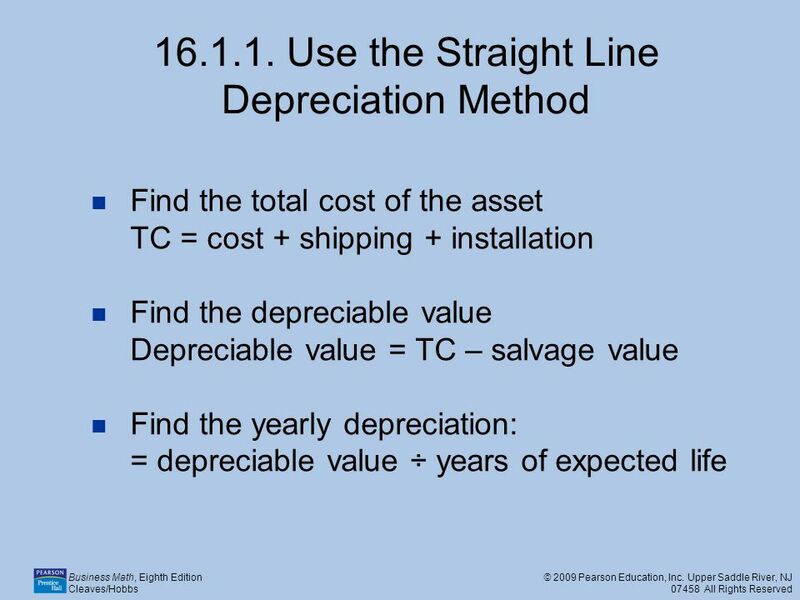 Apply an approved depreciation method to the value from the previous step, instead of the actual total cost. 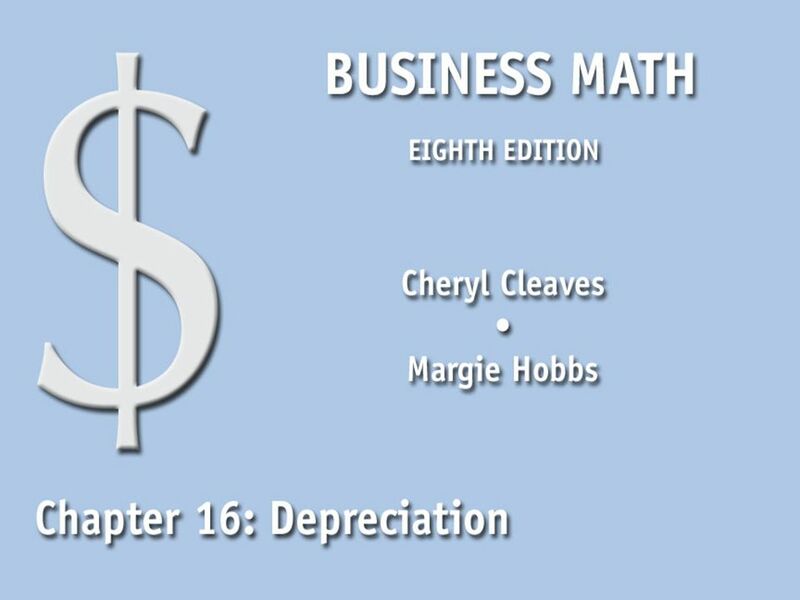 Download ppt "Business Math, Eighth Edition Cleaves/Hobbs © 2009 Pearson Education, Inc. Upper Saddle River, NJ 07458 All Rights Reserved 16.1 Depreciation Methods." 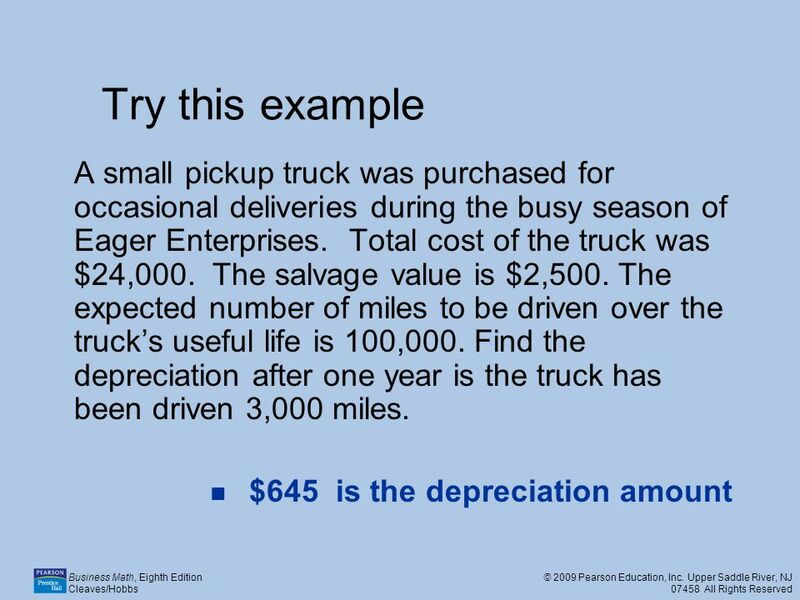 Business Math Chapter 3: Decimals. Chapter 9 Long Term Operating Assets May 2010 ©Kimberly Lyons 1. Chapter 9 Introduction Capital budgeting is the decision-making process used in the acquisition of long-term physical assets. Traditional capital budgeting. Objectives Discuss relevant cash flows and the three major cash flow components. Calculate the initial investment, operating cash inflows, and terminal.